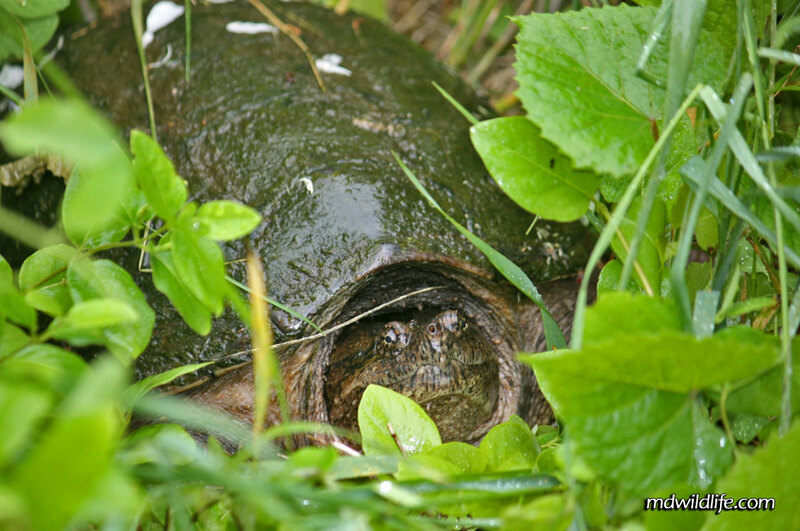 A snapping turtle hiding in tall grass at Millington WMA. Snapping Turtle (Chelydra serpentina) or the Common Snapping Turtle is an extremely widespread snapper that inhabits most of the United States, including all parts of Maryland. Turtles are common at almost all wildlife areas in Maryland, especially along the Chesapeake in the many marshlands and bay areas. Blackwater is a great place for spotting box and painted turtles. I have only seen one snapper, however. I remember I was walking along the path at Millington Wildlife Management Area and it had just started to rain. The Millington trail is wide and lined by small trees, shrubs and tall grass. I saw the tall grass to my left move independent of the wind blowing and had a feeling there was something in there. Usually, once the grass moves, you’re too late because the small rodent or snake or whatever has taken off, but I decided to peak in anyway. I walked over to the grass with my camera to glance over the top and saw what looked like a big rock. It was way to smooth and even to be a rock, I thought, so I picked up a thick, broken branch and used it to matte down some of the grass in front of the “rock.” I started a few feet away and flattened a path right up until I saw the picture above. The snapper looked kind of sluggish, so fearing it may have been hurt and could get cranky, I left it alone. The common snapping turtle is big. Impressively bigger than any of the other turtle species in Maryland. They can stretch their necks pretty far out of their shells and their revealing characteristic is a pointed nose and snapping beak. If you get a good luck at the face, you won’t mistake the snapper for any other turtle. As I do for most reptile entries, here’s a link to the folks at Towson University Biological Sciences.